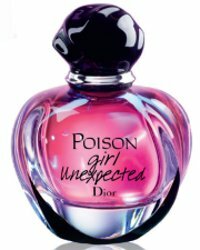 Christian Dior will launch Poison Girl Unexpected. The new fragrance for women is a flanker to 2016's Poison Girl, which was a flanker to 1985's Poison. Poison Girl Unexpected is described as a fresh floral with an overdose of ginger. Additional notes include blood orange and rose. Christian Dior Poison Girl Unexpected will debut in February; I will update with sizes and concentration when I can. I wish they’d bring back Midnight Poison instead. That was the best modern Poison flanker, agree! I remember both praises AND Turin’s negative review. I wish I could try it again but bottles go for so high! Maybe one day I’ll stumble across it in a discount store. Coumarin, I will just say that while I thought it was a good scent and the best Dior had done in recent times, I did not think it was full bottle worthy (obviously, I guess, since I never bought it). If a brand I had liked better had made it, I might in fact have thought they were slacking off. Still, it was a Dior I would have been willing to wear, which is more than I can say for anything they’ve made since. That’s good to hear. I do still blind-buy (under $30) but Midnight Poison has always been one of those “What am I missing?” perfumes. Years ago flanker mania was only the turf of cheaper or celebrity scents only. Now it seems the big companies have found a way to make layers upon layers within the brand and keep the main brand from losing prestige. Or at least they try! I am a Dior fanboy but these crazy flanker to me cheapen the brand. Dior doesn’t have much else at this point, so they have no choice! Is it just me, or does this name make no sense? Are you supposed to say “Poison Girl Unexpected”, like there’s been some kind of crime and Miss Marple or Poirot need to be called to solve the murder of (or murder by!) a Bright Young Thing? You think you know me, but you don’t -for No 5 L’eau. Kind of like they stuck a tunafish note in there. If they put in a fish note they’d have to call it Poisson. To me it calls to mind, “NO ONE expects the Spanish Inquisition!” ???? The only thing unexpected about this flanker is it’s name LOL. If we took bets on the name of a flanker for Posion Girl, I don’t think any of us would’ve said this. That being said, I don’t like the name at all. Well here we go with the flankers, the weird thing is that the bottle looks the same, they should have made it a little different to distinguish it more and for people that collect, to want to buy it for the different bottle. Since it looks the same I don’t know if it will be convincing enough unless the perfume itself really stands out. That is my humble opinion. Can the flanker names get any more ridiculous? They are really scraping the bottom of the barrel here.